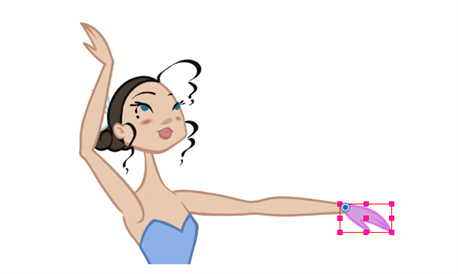 When animating, large movements that are made at the root (parent) of a chain cause secondary movements throughout the rest (children) of the chain. 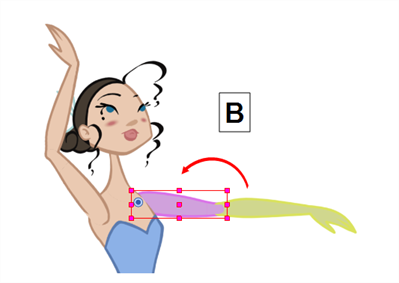 For example, when you rotate the arm of a character from the shoulder, the forearm and hand will follow. 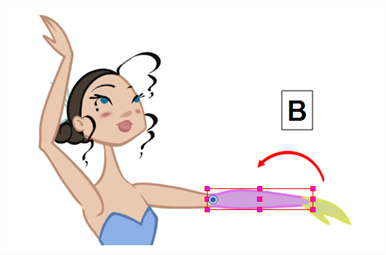 However, in order to make the movement appear natural and graceful, the forearm and hand should not move at the same speed or angle. As a result, animators often need to move up and down a chain, intermittently selecting parent and children, in order to make both large and fine movements. In the Camera or Timeline view, select a layer or object attached to a hierarchy. Select Animation > Select Parent or press B to select the parent layer. Select Animation > Select Child or press Shift + B to select the child layer. Select Animation > Select Children to select all child layers at the same time.